Note from Kreinik: We are so excited to have an article and needlepoint stitch guide from blogger and designer Janet Perry of Napa Needlework and http://www.nuts-about-needlepoint.com. Often we fall in love with a painted canvas needlepoint design, but don't know where to start when it comes to actually stitching it. Stitch guide writers like Janet tell you which threads and stitches can be used to bring a canvas to life. Thank you, Janet for sharing this project featuring Kreinik's new Easter Grass plus Kreinik Treasure Tape and Iron-on Thread. Like her, you can use a variety of materials on a needlepoint canvas. Don't be afraid to experiment and have fun! Kreinik makes a wealth of items that can be used to give needlepoint a whole new look. 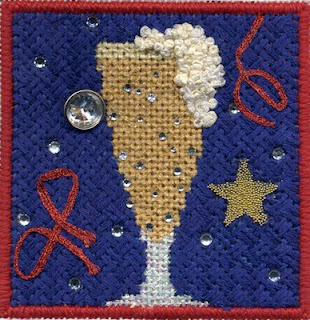 Using this painted canvas of a glass of beer, I used Kreinik threads, embellishments, and some items from my stash to make a distinctive needlepoint design. 1. Borders: Padded Gobelin using Silk & Ivory. Stop the padding stitches one thread before each corner. 2. Glass Base: Basketweave using Easter Grass. This thread is very stiff, so use short lengths and pull each stitch tightly. 5. Foam: French Knots done in several passes; each pass covering more of the foam. The first and second passes are with the two 1/8” ribbons. These should cover almost all the foam. The last two passes should use the white and cream Tapestry (#12) braids. These fill in the remaining area in the foam and build up the foam by being on top of the existing knots. These knots do not have to be perfect; they can be loose, use different numbers of wraps, and face different ways. If you like, you can add more knots using other white and cream threads. 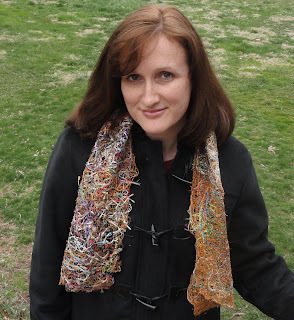 If you want to add highlights use Kreinik Tapestry (#12) braid in white (100) to add a few on top of the other knots. 6. NOTE: Before stitching the background, place the smallest size star from the Treasure Tape sheet over the star on the canvas, you will be stitching around it. Background: Double Trellis using six strands of Silk Mori. Stitch over the red streamers and over the white round. Leave the very center hole of the white round open and do not stitch the small white dots scattered over the background. 7. Button: Using a shank button about ½” in diameter, attach it to the open area of the white dot. 8. Star: Replace the star if needed, and peel off the protective red tape. Working over a paper towel to catch the excess, sprinkle gold micro-beads onto the star. Tip the canvas up and brush off the excess. Press star gently to be sure everything is secure. 9. Dots in Background: Using the 4mm crystals and the hot fix gun, attach these crystals to the small white dots on the background. Follow manufacturer’s instructions to attach. 10. Bubbles in beer: Use the 3mm and 2mm crystals and attach these to the stitches you skipped on the beer. Follow manufacturer’s instructions to attach. I found the 3mm crystals much easier to attach. If you like use all 3mm crystals. 11. Red Streamers: There is a red streamer on either side of the glass. These are applied after everything else using the Kreinik Iron-on ribbon. Use a dry iron and a Teflon press cloth. I cut the ribbon, then made the twists and ironed them on. One of the advisory boards on which I serve is the West Virginia University (WVU) Fashion Design and Merchandising School (FDM) Industrial Advisory Board. Through this position, I get to see the textile industry develop in my state and discover what students perceive as the newest styles and fashions. On a recent trip for an advisory board meeting, I witnessed exciting developments in both areas. The day before the meeting, the Fashion and Merchandising school held its annual fashion show. At this juried event, students of all different levels entered their creations. There were feathers, fascinators and fedoras. There were mini skirts and very short shorts. It was the first time that I've seen pockets in mini skirts. Many of the outfits had pocket lining of different colored and patterned fabric, which I saw as being quite creative. Along with the feathered fascinators, fascinating head gear included black crocheted hat decorations with butterfly patterns. You could easily see that a lot of work, time, effort and fun went into this fashion show. The future was also evident. WVU-FDM frequently works with a local middle school, and those students participated in the fashion show. Their mission was to design according to the theme of "recycle, reposition and reuse." Indie designers follow the same path - the "green" one - so perhaps this collaboration is the birth of the next generation of the "Handmade Nation." At our meeting, we also learned about the WVU Tartan project. The design and creation of a university's official tartan is a high honor, often under the auspices of the apparel and design school. Tartans are submitted to the Scottish Register of Tartans, and the design becomes a part of the school's identity. I can't wait to see how the official tartan of WVU comes together under the students and staff of the Fashion School. The Fashion School at WVU places emphasis on fashion and retailing, but since it is under the Agriculture School, there are also discussions on recycling, the use of animal fibers, plus the use of textiles in agriculture applications. As with any school, jobs are the goal. The students are learning draping, machine skills and merchandise knowledge. The challenges are out there. Time will tell if the program is a success, but from my perspective it is an exciting time for the textile industry in West Virginia. We are looking forward to growth both in and out of the state. Surprisingly, if you stick to ethnic food in Salt Lake City, your taste buds will enjoy many treats from Indian, Mexican, Italian, Nepalese, Japanese and more. Quilt Market has been a tasty treat and a great eye full of exciting Batiks, color, more art quilting and lots of creative clothing accessories. Aprons are big, fun tote bags and hats along with lots of interesting notions and new and exciting fabric print. Hand and machine embellishing of quilts along of course with lots of uses for metallics and silks are coming to a store near you. Spring Quilt Market in Salt Lake City has begun in blooming color. From the purple exhibit hall carpet to the vibrant quilts lining the booths and the eclectic clothes worn by attendees, from the cherry trees in bloom along the wide streets to the snow-covered mountains surrounding the city, this place is FUN. Sample Spree last night was a shopping frenzy, with women and men of all ages carrying around enormous tote bags filled with fabric, thread and notions. TV personality Eleanor Burns was there in a space costume, but Doug Kreinik stuck with his favorite Kreinik tshirt - don't want to distract attention from the threads. If you want color, get some Kreinik thread. We met lots of long-arm machine owners, embroidery companies, fiber artists, and quilt shop owners all looking for a little metallic to add to quilts. We sold out of red, copper, and purple machine sewing Gimp thread immediately. We also sold our new Iron-On Bag o'Bits to the delight of people who have requested it for years. Top ideas for the bits include jewelry, gifts, ornaments, and other quick projects. It really doesn't get any faster than a fusible embellishment thread. So far today, market has been busy. 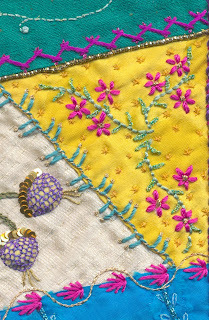 Hearing many shops say hand embroidery is becoming popular. We are next to the fun ladies of Moonthistle Designs with wool felt designs featuring Kreinik thread for stitch embellishments. The look is subtle but more eye-catching than the traditional somber wool look. Check out her "Party Crow" pattern (web site www.moonthistle.com). We have a Bernina Artista sewing machine running in the booth. We will be decorating some pillows, making scarves, doing dome clicking and bobbin work. We love how versatile the new sewing machines are and the Kreinik threads sew smoothly and beautifully. We have one of our gold threads running on a Gammill long-arm right behind us and it looks stunning on black fabric. This is just Day 1 of market and we are excited to talk with shop owners and designers, and are already inspired with new ideas. Wish you could see it! Stay tuned to Kreinik Facebook for more pictures. This week we jet off to Salt Lake City for the Spring Quilt Market. We thought it would be fun to focus on quilting this week. Check back this week as we will be posting throughout the week with additional content. Kreinik has teamed up with Terri O to make two educational videos using Kreink's Bag 'o Bits and Iron-On Threads. See how easy and fun our threads are to use. Click on the links below to see these new videos.